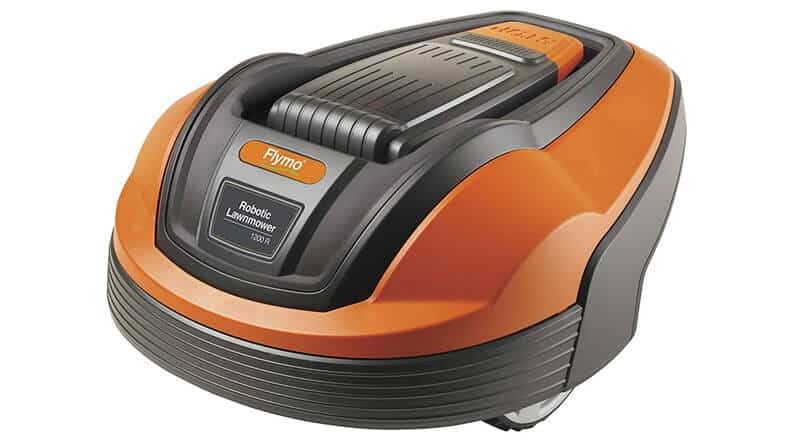 Home Products & Reviews Garden Machinery Flymo 1200R Review: Is the Flymo Robotic Lawn Mower Any Good? The Flymo 1200R does what it says on the tin. When compared to other robot lawn mowers, it’s cheap. At the same time, it’s well built, works in the rain and is packed with safety features. Most importantly though it works. Quietly going about its business and taking care of the most important aspect of caring for your lawn. It doesn’t make vodka-martini, despite what the video says! 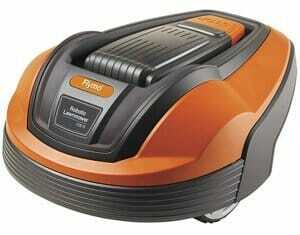 Who is the Flymo Robotic Lawnmower For? It’s easy to understand why robot lawn mowers aren’t mainstream yet – they’re just so expensive. Some models cost upwards of £3,000 which puts them in the same price bracket as ride on mowers. If you have a small lawn, it’s incredibly difficult to justify that kind of expense. It’d make more sense to stick to an electric lawn mower or a cordless version. 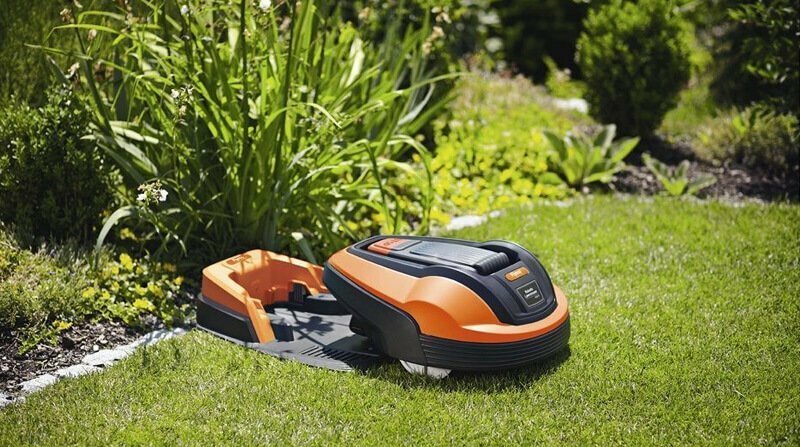 However, this Flymo robotic mower has bucked the trend, coming in at a more acceptable price of around £600 (at the time of writing). That’s still pretty expensive but when you compare it to other models, £600 it’s cheap. But is it a model you should consider? Then the Flymo 1200R is definitely worth consideration. Let’s start with the price, as, for many, this is a major selling point. At the time of writing, you can buy the Flymo 1200R for around £600 from most retailers. Now, when compared to a push mower, electric or cordless models, £600 doesn’t sound cheap at all. However, most robotic lawn mowers sell for at least a grand with the best robot lawn mowers selling for more than £4,000. When compared to these, £600 IS cheap. 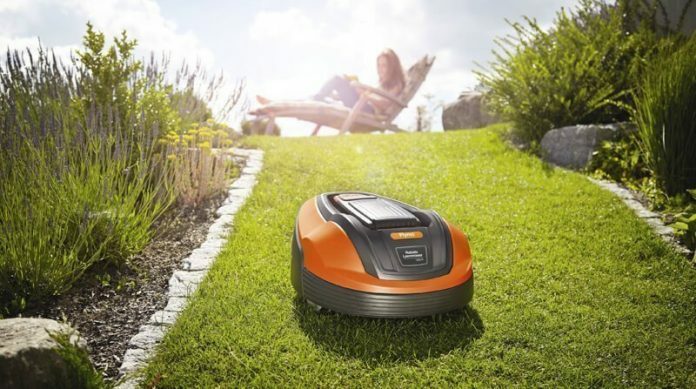 Despite being a ‘basic’ robot mower, the Flymo has all the mowing features you’d expect. The Flymo 1200R covers a maximum lawn area of 400m2. While this is considered small in comparison to other machines, the average sized garden is actually a lot less than that. So in actual fact, it’ll probably suffice for the majority of people. However, if your lawn is more than 400m2, don’t buy the Flymo thinking it’ll cut a larger area and you’ll save money. It’ll just leave areas of your lawn uncut. So if your lawns are larger, choose another machine. The cutting width is fairly narrow at 17cm. It has three tiny pivoting blades which are attached to a single spinning disc. These blades cut the grass and mulches the clippings before spreading them back into the lawn. You can adjust the height settings between 20mm to 50mm via a big knob on top of the machine. This should give you plenty of control over how tall you cut the grass. It’s advisable to cut long grass with a regular mower before installing the robot. Then, set it on it’s highest setting, gradually reducing the height. Like most robotic mowers, the Flymo has a completely random mowing pattern. It sets off in one direction, detects an obstacle or perimeter wire, turns a few degrees and carries on in another direction. This prevents any track marks being left in the grass. The downside being that it won’t stripe your lawn. If your lawn is on a slope or has inclines in it, the Flymo will cope with them up to 14° pretty well. However, anything more than that and it’ll struggle. The Flymo 1200R has a reassuring number of safety features too. It has ‘Lift & Tilt’ sensors which stop the blades from spinning if it’s picked up or tilted past a certain angle. Should your kid’s curiosity get the better of them, this feature will prevent nasty accidents. If you do need to pick the robot up for whatever reason, there is also a big STOP button for the more cautious. To start it again, either put it back in its charging station or enter your PIN number. This is for both safety and security. It prevents the robot from either being stolen or used by someone that shouldn’t be using it. If anyone tries to pick it up or use it, the alarm will go off, alerting you to the problem. This will render the mower useless until you enter your PIN code. Bump sensors are designed to prevent the mower from damaging things like trees and other obstacles in your lawn. If it bumps into something solid, it’ll back up, turn through a few degrees and go off in another direction. That said, it’s advisable to keep your lawn clear of obstacles as much as you can. Too many obstacles can result in areas of your lawn not being cut. It’s important to note that this doesn’t work for small obstacles like stones or twigs. The mower will roll right over the top of them which has the potential to damage the blades. Raking away debris will prevent this from happening. The Flymo is a very quiet machine with a noise level of just 58db. This is equivalent to a quiet conversation between two people. There’s no need to wear ear defenders and you can enjoy your garden while the mower is working. In fact, Flymo goes as far as to say that it can cut the grass in the middle of the night without upsetting the neighbours. Setting the mower up is actually fairly easy. It does take a little while but that’s ok considering you’ll never have to push a mower around again. Plus, Flymo’s instruction manual does a pretty good job of explaining how to do it. They also have loads of helpful videos on their YouTube Channel. 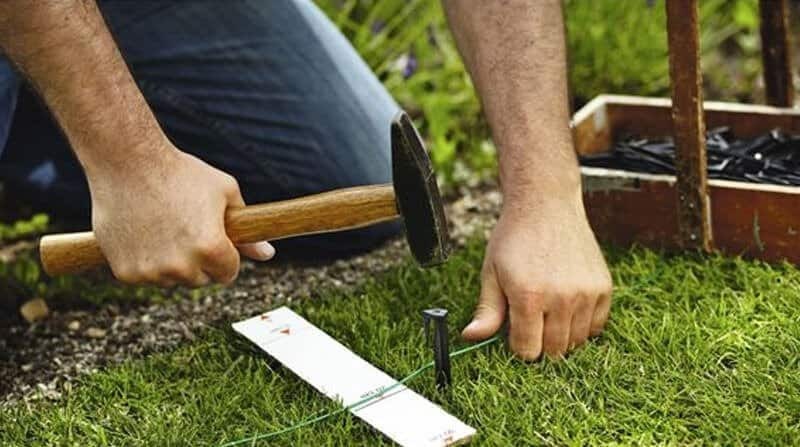 The first thing you’ll need to do is set up the perimeter and guide wire, marking off areas that you don’t want the mower to damage, like trees and borders. You can either peg it to the surface of the lawn or bury it. If you bury it, expect the set up to take longer. If you have a bumpy lawn, it’s advisable to bury the wire so the mower doesn’t run over and cut it. Once you have the laid the perimeter and guide wire, it’s time to set up the machine itself. 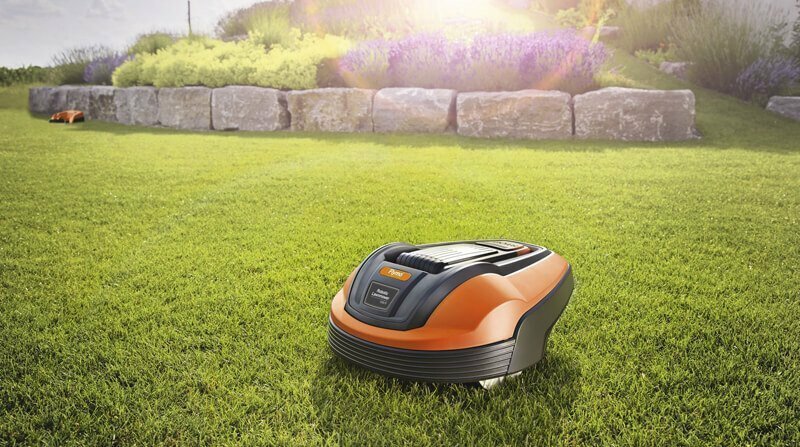 With the Flymo 1200R robotic lawn mower all set up, there’s really nothing else to do except watch in wonderment as it wakes up and goes about its business. You might need to adjust the perimeter wire based on how far to the edges of your borders it cuts or doesn’t cut. So we’ve covered the features and set up, but how does it actually perform in practice? I have to say, it’s pretty good! Setting up the Flymo robotic lawn mower wasn’t difficult. It took a couple of hours to fully get it up and running which is to be expected. For the purpose of this test, I just pegged the perimeter and guide wire to the ground instead of burying it. The lawn was pretty flat so I was confident that as long as I kept the wire taught, there would be no issues with the mower running over and cutting the cable. The mower cutting the cable isn’t dangerous, it’s just a pain to connect the ends together. The lawn I tested on was just under 400m2, had a couple of trees in it and flowered borders around the perimeter. So when it came to programming the machine, I just left it at the factory settings. This meant the mower to came out every day of the week, mowing and charging relentlessly. It did take a bit of time for ‘Freddie Flymo’ as he became known to settle in. Firstly, we did have a few issues with the machine dropping off the edges of the lawn and getting stuck in the borders. This meant we had to adjust the position of the perimeter wire to prevent it from happening. Not a big deal and it’s reasonable to expect that you’ll need to adjust your perimeter wire in some areas. Secondly, for a while, the lawn was left with a few strips of uncut grass that resembles little Mohican hairstyles. I did wonder if Freddie Flymo would ever get to them or if I’d have to do it myself. However, each and every time the mower came out, the strips of uncut grass became less and less. 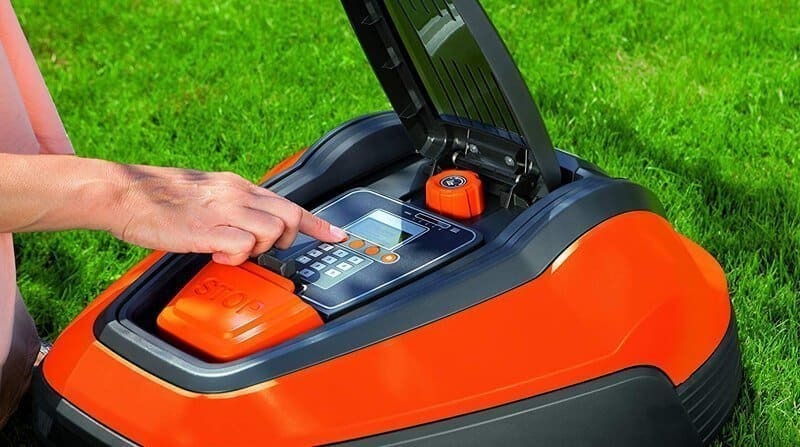 Once the initial setup was done and we got over the ‘settling in period’, the Flymo robotic lawn mower went about its business with virtually no input. He just woke up, mowed the lawn some then went back to recharge before coming out again. And unlike a regular electric, cordless or petrol mower, you can barely hear the Flymo at all. I could spend my days enjoying my garden without being interrupted by the noise at all. The benefit of having the robot come out and cut the grass every day is that the grass clippings are tiny. They’re mulched and put back into the lawn where they essentially act as a fertiliser, keeping all the moisture and nutrients where they need to be. Also, because mowing every day prevents the grass from growing upwards, it’s forced to grow sideways, growing new runners, new shoots and new leaves. This creates a thicker, denser, lusher and healthier lawn. And this is exactly what happened, as time went on the lawn looked better and better. Maintaining the Flymo 1200R is pretty painless. I simply turned it upside down every couple of weeks and brushed it down before giving it a wipe. The tread of the wheels can get clogged up too if the grass it wet so I gave them a once over with a stiff brush. It’s important to make sure the blades move freely (be careful!). Sometimes grass clippings can get caught under the blades causing them to stick. Flymo recommends changing the blades every 4-7 weeks. This is because unlike a regular mower, they’re constantly working and as a result, the edges will start to dull. How quickly this happens though, depends on how often you have the mower go to work. It comes with 9 spare blades which should be plenty to get you through a season. As good as the Flymo robot mower is, it isn’t perfect. Because I had to adjust the perimeter wire to stop the mower falling into the borders, it didn’t cut right up the edges. It’s the same for along walls, trees and fence panels. This meant that every couple of weeks I had to manually tidy up the edges of the lawn with shears and/or a strimmer. However, if you have a mowing strip or some other kind of lawn edging, this wouldn’t be an issue. Also, unlike other robot mowers, the Flymo doesn’t have any smart features. It’s nice to be able to control your mower or b notified of any issues via your phone. For example, if you want to set the mower off manually, you need to go outside and do it. An app would mean you could do it directly from your phone. Also without keeping an eye on what the mower is doing, you’d never know if there was a problem. Smart technology would send a notification to your phone to let you know something is wrong. For me, neither of these issues are deal breakers but still, they’re worth mentioning. Flymo 1200R Review: Should You Buy it? I’ve been quite critical of Flymo lawn mowers in the past but I have to say, I really quite like the 1200R. It’s not perfect and it does lack some of the features of the more expensive models but it’s several hundred pounds cheaper. Those savings have to come from somewhere. If you have large lawns, the terrain is more suited to a heavier duty machine, you’d like more tech or budget doesn’t matter, then I doubt the Flymo is the mower for you. However, if you’re looking for a machine that’ll do a good job at a sensible price then it has to be worth considering. It’s well built, reliable, safe to use but more importantly, it works. It cuts the grass well and gives your lawn that ‘just cut’ look all of the time. But don’t just read this Flymo 1200R review and take my word for it. Amazon.co.uk has hundreds of reviews from other users. I hope my Flymo 1200R review has shone a light on whether or not this is the best model for you or not. But now it’s time for me to hear from you. Do you have the Flymo 1200R or are you thinking of buying one? Do you have a model you prefer? I’d love to hear your experiences, questions or comments. Leave a comment below and I’ll join the conversation.